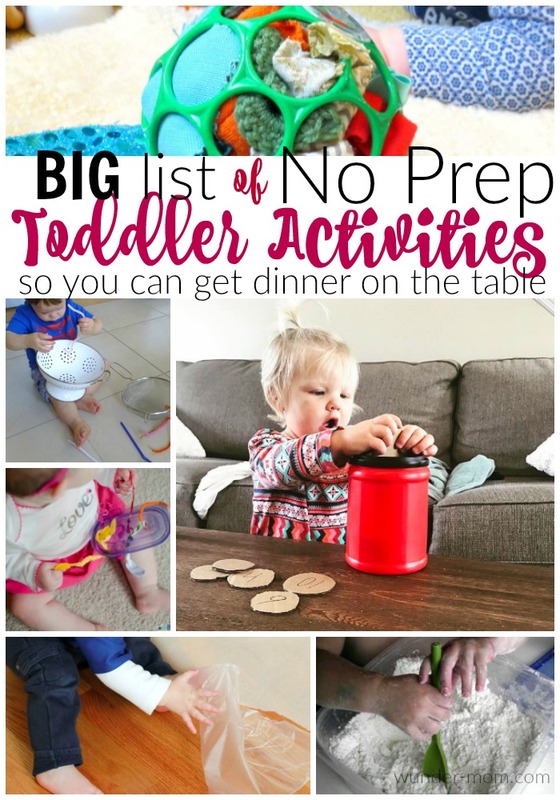 Try these no prep toddler activities to keep your toddler entertained so you can get dinner on the table. It’s late afternoon and you have to start thinking about getting dinner ready. If your house is anything like mine then you also have a toddler that just woke up from nap, grumpy, and getting into anything and everything they can. Or they are hanging on your pant leg trying to get you to play with them. Now don’t get me wrong, I love to cuddle and snuggle and play with my tiny tot, by I also need to get dinner made for the other three children and my husband. So what’s a mama to do? Every afternoon, I pull out a no prep toddler activity to keep her busy while I cook. I sit her down at her small table in the kitchen, or in her booster seat at the large table, show her what to do and get cooking. This usually buys me enough time to get dinner prepped and in the oven. We use simple activities that need no prep and not much clean up. Things like stickers, blocks, puzzles and fine motor activities. This is a comprehensive list for you of some of our favorite activities.